What is Mason Jar Beekeeping? The beekeeping industry has come a long way. Beehive designs have been invented and reinvented. Just not long ago, no one imagined you could keep bees on your rooftop, or let alone keep bees in your apartment house in the city. All these have become possible thanks to the selfless efforts put forth by beekeepers across the globe. Mason jar beekeeping happens to be one of the latest inventions in beekeeping. It is well suited for small spaces and all that it takes is a little research and planning for one to begin. Literally dozens of beekeepers who reside in the city or anyone with a suburban backyard can now raise bees the mason jar way. As its name suggests, mason jar beekeeping refers to keeping bees in mason jars. The mason jars are fitted into the ordinary hive, where in this case the bees will utilize the mason jars when making combs and honey instead of (or in addition to) using hive frames. Once the honey jars are filled with honey, they are taken out of the hive. The bees might take some time to figure out the use of the jars. However, once they get things right, it becomes so much easier for the bees to build their combs inside the mason jars. A DIY project for Mason jar beekeeping is possible and this can be done by anyone with some wood, bees, and the jars. Perhaps you have seen some photos of beekeepers that have tried mason jar beekeeping, or read some success stories about keeping the honey bee in jars. These may seem too good to be true. However, it is indeed true anyone can begin keeping bees in mason jars. Most beekeepers within the USA have tried this with success. It is not as complicated as one might imagine. Mason jar beekeeping entails combining mason jars with an existing hive. The jars are placed above the hive box supers. One of the simplest designs of the mason jar hive is a combination of a square board made from pine. A borer is then used to drill equally spaced holes that will hold about 6 to 8 mason jars. The excluder is not required in this hive design, though you can place an empty super box above the jars to act as shelter above the jars and provide a platform for holding the hive roof in position. 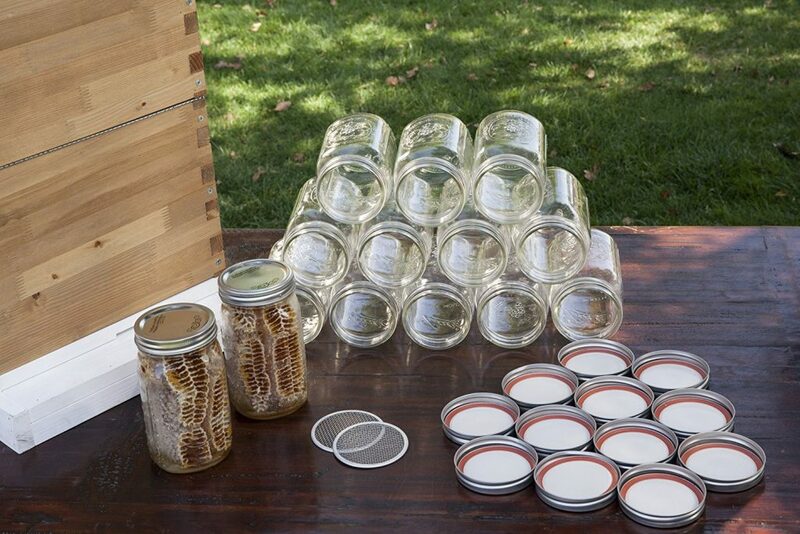 Most standard hives have the desired height that can accommodate the mason jars. The wooden board that holds the mason jars is at first measured and cut to the required fit for the hive. Holes are then bored into the board and these will be same size as the mason jar mouths. The first few weeks upon setting up the mason jars may prove to be the most challenging and disappointing. The bees may seem to take no notice of the jars and they might not begin building wax and combs on the jars for awhile. Later on however, they will begin by building wax on the sides of the jars then build the combs upwards. If you are keen, you will notice some of the combs protruding from underneath the jars. The bees should be allowed to take their time when building the wax and combs, even if this could be a slow process. You should avoid lifting up the board or jars at this time. In most cases, the bees will focus on the hive frames before moving up to the jars. This should not discourage you since they work on what they are familiar with at first. That means it will take a while before they build combs in the jars. Once they begin, they will fill up the jars in no time. You should however take off the jars before the bees store too much honey in them. There is only a little space to build the combs and that means it might not take much time to get the jars filled. Tinsmith John Landis Mason born in Philadelphia in the year 1858 had no clue that one day the mason jar would be useful. His quest to find a safe storage for food led him into discovering the mason jar. The jar has become useful in households and commercial enterprises. Boiled fruits, honey, vegetables, butter, and many other products are now kept in the Mason jar. The transparent jar is now used in mason jar beekeeping and this has been a great step in alternative beekeeping practices. The mason jar beehive is easy to design and build. Anyone with a bee hive box with the required components can build the mason jar hive. You can utilize your locally available materials to build a unit for yourself. It makes honey harvesting so much easier since the combs are inbuilt within the jars. Upon harvesting the beekeeper picks fully filled jars and extracts the honey from the comb. This design of beehive immensely reduces workload to the beekeeper and minimizes stress to the bee colony. All that is required of the beekeeper is regular checkup on the hive using the quick-check super. This makes it so much easier to monitor the activity and health of the bees. It makes hive predation and stealing difficult. Robber bees cannot easily access the honeycombs built inside jars. Makes it easier to expand the current limit of the beehive. The mason jars are placed on top of existing hive frames and the bees will begin building combs and filling them with honey on the jars once lower frames are exhausted. Greater productivity per square feet. Beekeeping productivity is much higher when you adopt smart ways of utilizing your bees. The mason jar beehive is a smart design that makes it possible for the beekeeper to harvest more honey from the same hive with no need to build another hive from scratch. More food reserves for the bee colony. The extra honey stored on the mason jars serves as future food for the colony. The beekeeper is therefore assured that the bees with never ran short of food for as long as the jars as well as the honey frames are full of honey. More economical for the beekeeper to add mason jars instead of building or buying a new hive box. Easy management. It much easier to manage bees in mason jars unlike those in the standard beehive. The beekeeper has to manage the bees on the frames below as well as those on jars but it is easier to manage those on the jars. Since this is a new way of keeping bees, most beekeepers are skeptical in adopting it at first. We all have our doubts with anything new. It will be disappointing initially when you open the beehive to check out the mason jars. The bees might not begin to build the combs inside the jars sooner as you expected. The sight of empty jars for sometime might disappoint you. Mason jar hives have a serious ventilation problem. They therefore require more care unlike the ordinary hive where air flows freely within the beehive. Honey bees are fascinating creatures. They might find it easy to build combs on trees, stone crevices, in roofs of garages, and many other areas. However, when you want them to build the combs inside the jars they might not consider it. In most cases the bees may build the combs as a last option when they have used up all the frames in the bees. Remember the mason jars are placed on top of the hive, just above the honey frames. The options available for ready-made mason jar beehives are a few in the market unlike the ordinary beehive. The reason for this is quite obvious. Ordinary Langstroth beehives have been in use for many years but the mason jar practice is relatively new. Just a few manufacturers have begun designing the jar beehive unlike the ordinary hive where so many manufacturers are already in the market. The most notable difference is the fact the bees will build the honey combs inside the jars in the mason jar beehive. This is not the case with the ordinary hive where the bees utilize the frames provided. Space is not a problem for the regular hive. Space is limited for the jar hive. As a matter of fact, the bees tend to move to the mason jars once they have exhausted the supers underneath. The mason jars are more immune to robbers or honey and bee predators. The comb and bees are hidden within the jar. Robber bees and predators can easily gain access to susceptible ordinary hives. Honey harvesting is much easier with the jar beekeeping. All the beekeeper has to do is lift up the full jars and take home the sweet honey. As for the ordinary hive, you need to smoke the hive, uncap and separate combs before using the extractor to get clean liquid honey. Most of the work involved in the ordinary hive is eliminated when you have the mason jar beehive. It is more economical to install a mason jar beehive than an ordinary hive. Once frames are filled and additional frames added, you have to purchase another box. As for the jar hive you simple add the jars on top of the frames so that the bees can move up when all frames are full. The bees take a shorter time to build the combs and wax when it comes to the ordinary beehive. However, this is not the case with mason jar beehive. The bees may never notice the jars within the first weeks when installed. It may even take longer. The price for a ready-made Mason jar hive does not differ so much with that of an ordinary hive. The materials for building the jar hive are also affordable and that means it will cost almost the same amounts to build both types of hives at home. Smoking is a requirement for the ordinary beehive during honey harvesting or regular maintenance. As for the Mason jar beekeeping this is not necessary. The beekeeper is advised to use a one-way bee escape just underneath the super. This will help remove the bees from the jars. When smoke is used, it will persist in the jars. 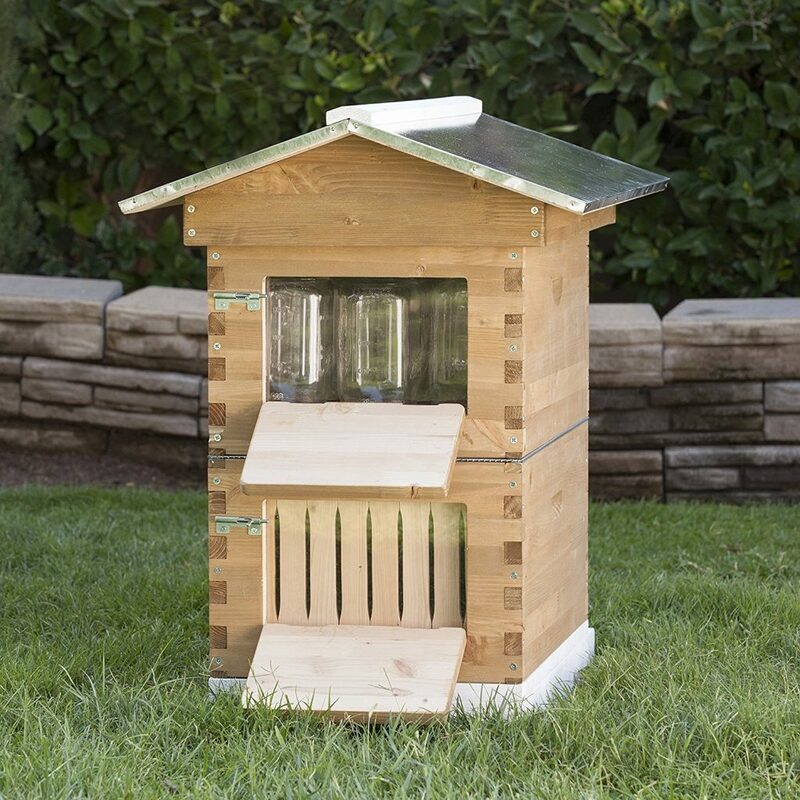 This is a top hive for the novice. 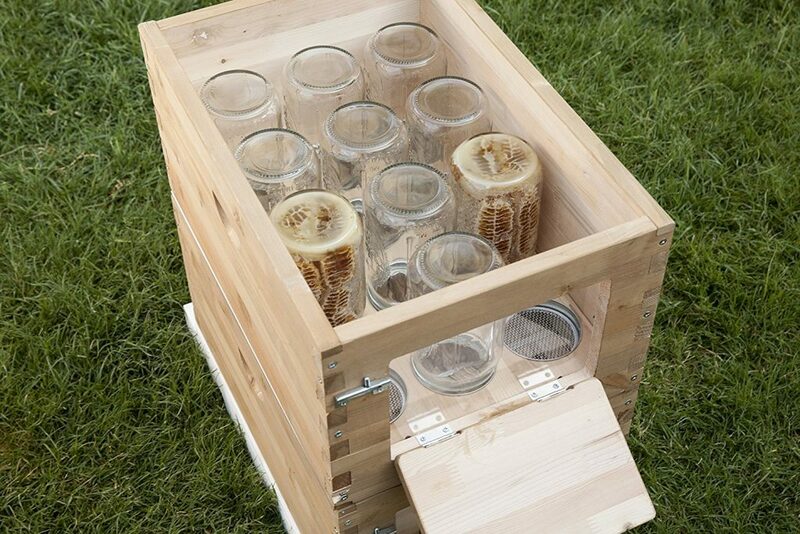 It is an innovative hive that has been designed to perfectly to fit the jars which will be filled with honey. This is well suited for all locations whether a rural setting or suburban location. You can also place this on your rooftop whether in the city or rural area. The hive has been built using Canadian Hemlock wood that has been harvested sustainably. It is designed with finger-joint construction that makes assembly easy. Comes with mason jars complete with the lids. The frames within the hive box are pre-waxed and the queen excluder is made of stainless steel. The inner cover and jar screens are ventilated. Available are quick-view windows for the mason jars, and the honey supers. It is covered by a 3 year warranty. Click here to read our full review of the SummerHawk Ranch 38533 Honey Mason Jar Beehive. The mason jars are enclosed and that means it can get hot easily within the jars. This also means that the ventilation within the jars is low. Beekeepers are therefore encouraged to keep the mason jar hive away from sunlight. Alternatively you can place a screen over the jars to act as shelter for the bees. The bees might not notice the jars at all during the first weeks you set up the jar beehive. You can overcome this by placing a comb inside the jar. These will lure bees into the jars. The bees if not controlled can build their combs and accumulate wax in the area surrounding the mason jars since it is easier for the bees to build combs in this area. This will force the beekeeper to remove them. To avoid this, keep the bees off this area. The jars should be designed in such a way that the bees are not granted access to the surrounding area between jars. Dirty jars can pose a serious health risk to the bees and the beekeeper. The jars should be cleaned and sanitized before use. Once jars are filled with honey they need to be removed with care. It is not easy to remove them since the combs and wax holds the jars tightly. One easy way to make the jars easily removable is by using the mason jars without removing the lids. In such a case, wide enough holes would be bored into the lids. Mites such as the Varroa are common with all types of hives including the mason jar beekeeping. You can help keep it off by using a screened bottom board. The jar hive is a challenge to the novice but you can take some beekeeping classes. It might seem insurmountable but it is not. The guidelines for building the mason jar beehive are simple and easy to follow. Food shortage that cripples the bee colony during the hard seasons will also affect the mason jar beehive. To overcome this, you need to employ a jar design that has a centre at the middle. This will be used as the jar feeder. A combination of 1 to 1 water and syrup will suffice and this will stimulate wax production. You should however remove the food supplement when the nectar flow begins to increase. Ventilation is a major challenge in the mason jar beekeeping. This can be managed by providing a small upper entrance underneath the super. If you have been considering engaging in beekeeping that maximizes productivity per square foot then you should try using a mason jar beehive. This is the latest method of raising bees in small spaces, backyards in suburban regions, or rooftops in apartments. It complements the standard hive and does not take much to design and build. As the name suggests, the bees build the combs inside the jars, fill them with honey, and this can be harvested by the beekeeper. Have you ever used mason jars in your beekeeping before? Leave a comment below and let us know what your experience was like.